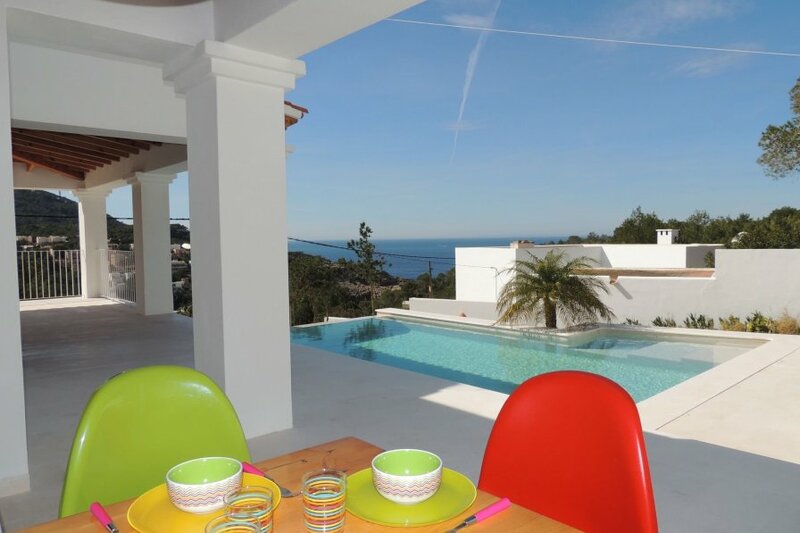 This very well-equipped house is located in Cala Vadella, famous for its wonderful beach for children. You walk through a small path to the beach with nice restaurants, shops and terraces everywhere. With your feet in the sand, enjoy a cocktail while the children are having fun with building sandcastles and swimming. There is free parking for 2 cars. From the pool / terrace you have a beautiful view of the bay and you are able to enjoy the most beautiful sunsets. This house has been completely renovated and is decorated with fresh materials in nice colors. The house is very clean and the owners are lovely people who take care of you with all sorts of extras. For example, for every guest there is a small gift. For the whole family there are games available and there is even a Nintendo Wii / PS3 game console with matching games. There is also satellite TV etc. In this house you really don't miss anything; there is a fruit juicer, Nespresso machine, toaster, everything is present. On arrival there are even drinks in the fridge and also the coffee cups, tea, laundry powders and all kinds of necessities are available in abundance, so do not have to buy this yourself. Shortly, an ideal house for one or more families or couples.